I don't typically making indulgent foods lighter - they never taste the same, and I end up eating way more than I otherwise would to be satisfied. I'd much rather just eat sensibly 80% of the time and then indulge when necessary. The cauliflower is steamed and then pureed with a little milk and cheese to form the sauce for the noodles. It's then topped with a little more cheese and baked until it's bubbly and delicious. 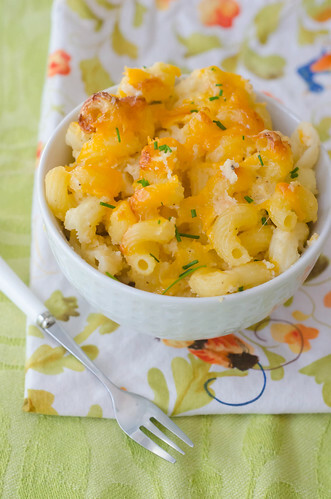 Does it taste identical to the most decadent, cheesy, rich mac & cheese you've ever had? Of course not. But it does taste great. It's still creamy and silky, and by using a combination of sharp cheddar and Parmagianno-Reggiano, you don't have to use as much to gain great cheesy flavor. I actually think it would be quite tasty to add in some roasted or steamed cauliflower florets in place of some of the pasta as well - I love texture, and I think it would be a great addition. So if you are a mac and cheese lover like me, then give it a try. It's much healthier, but you get to feel good about what you're eating and feeding your kids. Win win. *I do realize that some kids are immensely picky, and drastic measures are necessary. But in general, I feel like many people don't give kids enough credit and feel like they have to be "tricked" into eating healthy food because they couldn't possibly like a vegetable without thinking it's a french fry. Position a rack in the center of the oven and heat the oven to 375°F. Lightly grease a 9x9 inch baking dish. Transfer the cauliflower, onion, and garlic to a blender. Bring a large pot of salted water to a boil. Add the pasta and cook for 3 minutes less than the package timing. Drain and return the pasta to the pot. While the pasta cooks, add 1 cup of the milk, the dry mustard, 1 tsp. salt, cayenne, and 1/2 tsp. pepper to the vegetables in the blender and purée until smooth. Transfer to a 3-quart saucepan and stir in the remaining 1 cup of milk and the thyme. Heat over medium-low heat until hot but not boiling, about 3 minutes. In a small bowl, mix the Cheddar and Parmigiano. Add all but 1/2 cup of the cheese to the sauce and stir until the cheese is melted. Add the sauce to the pasta and stir to combine. Transfer the pasta and sauce to the prepared baking dish and sprinkle with the remaining cheese. Bake until heated through and the cheese is beginning to brown, 20 to 30 minutes. I love veggies and yet I'm still all for adding more of them to my meals! Sounds like an awesome mac and cheese to me! And yeah...I won't be sugar coating things for my kids either. I have a cauliflower ready for this recipe! How much onion? Dee, it's half of an onion, thanks for catching the omission - I've updated the recipe now. Hope you enjoy! Thanks, Josie. I am going to make this next week. I know I will enjoy it! This sounds wonderful! And, I totally agree with you on the whole hiding veggies from your kids thing! I always privately cringe when I read that on a recipe. I love your recipe! It's healthy and delicious. I totally agree! I want Elliott to love and enjoy vegetables, and I want him to KNOW he loves and enjoys vegetables! Right now, I'm lucky, and he does. I hope he continues to do so. And by the way, I get behind on blog reading, so I am just now catching up. Including this post, I have bookmarked your last 5 posts!! You rock! I truly think you must be Wonder Woman in disguise to still be cooking and blogging, all while taking care of a preschooler, a toddler, and newborn twins! Made it tonight...yuck. Major disappointment and waste of ingredients. Yummy! I think I'm having this one for dinner. Hi! Thanks for sharing your recipe. My son James loves this pasta.